The Arena di Verona is a colosseum from Roman times, supposedly the second largest in existence, and it continues to be in excellent condition. 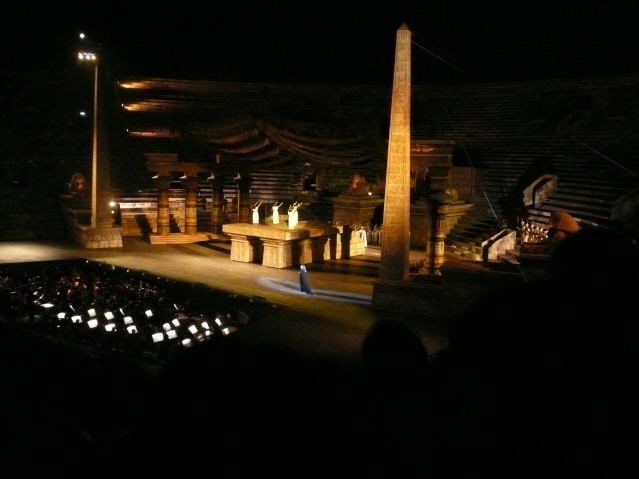 Opera performances in the Arena di Verona began in 1913 with this production of Aida. Since they are nearing the centennial, we were surprised they didn't save the revival until then. For years people sat on the stone stairs, but now there are metal bleachers with somewhat uncomfortable but manageable seats that fit about 3 rows of tiers to the original Roman 2 rows. These seats are more expensive and reserved and reach about halfway up the side. Above on the original Roman seats it is first come first served. The expensive seats are on the floor of the arena. We were about 1/3 back on the right -- just about the perfect spot. About a third of the arena is occupied by the enormous stage. A successful production in the arena requires that the massive arena itself provides the spectacle. It is the enormity of it all that impresses, and this enormity makes Aida truly come alive. The trumpet bands for the procession can be positioned high in the bleachers. Coordination with the far away conductor was excellent. We hoped for elephants but were happy to get six horses. The sense of increased realism is wonderful. And then there is our celestial Aida, sung by Isabelle Kabatu. She looked and sang to perfection, making the whole thing seem easy, as though she arose in the morning and thought, "I think I'll sing Aida today." 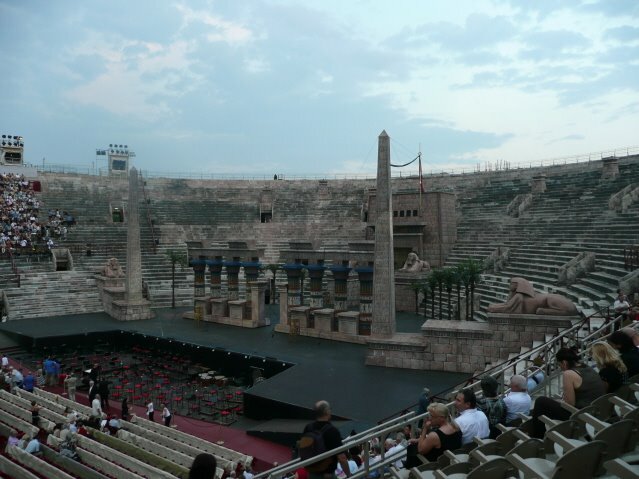 Arena di Verona relies on its natural acoustics which vary but never fail. We noticed that when a singer faced the other way her voice became louder. I liked the tenor Piero Giuliacci, a large man with a full voice and a nice ping in his high notes. He seemed to be able to carry the necessary strength in his voice without oversinging. Our fabulous Amneris was Marianne Cornetti, and our even more fabulous Amonasro was Ambrogio Maestri. The consistent quality of the whole production was very impressive. The set units come from an entry in the middle and must fit in it. Then they are moved around the stage into different formations. 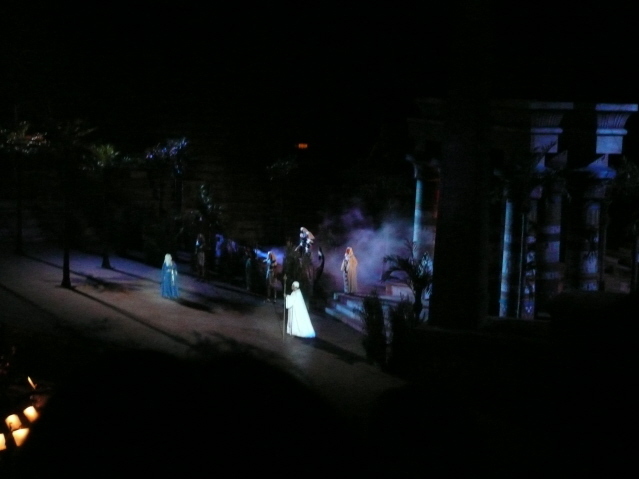 In the final tableau Amneris stands above the entombed lovers while the chorus sings from high in the tiers. Supers with torches line the rim of the arena. Aida will never be the same.